The expanding Victorian middle classes tended to ape the upper classes. Hence, they filled their houses with fine-looking furniture and decorative art, much of it bought on credit schemes. This new ostentation brought with it new responsibilities of maintenance, however, and the middle classes tended not to have the domestic servants that the upper classes had. 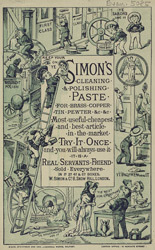 This led to a trend for labour-saving devices and products, such as this "polishing paste". This could be used on brass, copper, tin and pewter. It would have been particularly useful in cleaning the kitchen range, which generally had to be cleaned, black-leaded and polished every day.